Andrew Little’s solution to the retirement age problem (TV3 Dec 15, 2016) is a very reactive approach. He is right to suggest that many practical workers and tradespeople reach the age of 65 worn out and are ready to stop. However, helping them then is too late; the solution he should be considering is providing some opportunity in the years 45-50 to rethink and re-strategize potential work and training options. Most people never do this but welcome the opportunity if it is available. The concept of our ‘second adulthood’ has been around for many years, referring to the years from 45+ where there is a need to systematically think about how you might spend the next 25 years, given we will all be working longer. I discovered in researching the strategies of older workers who maintained employability well into this older period that the people who solved this problem for themselves were those gifted with a range of attributes. Specifically they were proactive – able to scan the environment around them and see what was likely to derail or progress them; adaptable – able to accept and make the work changes required, identity aware – they had some knowledge of the best options for themselves and where they thrived as workers, and they were naturally continuous learners – they sought out and optimised learning opportunities to stay current with their skills. So the good news is that there are strategies that assist people to keep working and in jobs where they continue to thrive; the other news is that only 25% of the sample I researched had these capabilities naturally. The others had combinations – for example many were adaptable but their identity compass was faulty, and without a clear sense of self that could send them in the best directions they found themselves adapting to work that didn’t really suit them, and therefore they were not very happy with their choices. A lack of adaptability meant holding on to unsuitable jobs long past their use by date; a lack of knowledge about learning or change opportunities meant many had no idea of how they could have changed their lives in a more positive way to make their later working years more acceptable. So people need help, and career specialists and / or new knowledge (accessible online packages?) can assist them. While one can argue in 21st century work people are responsible for their own career management, we know that most people don’t know how to do this. Given an opportunity to put in place a plan or framework for change in the mid to late 40’s stage, a chance to identify and consider where all those skills knowledge and capabilities might be applied beyond the existing job role would open new options for training, learning or exploration- and the time to do it ie before they need to change. Many are forced to do this too late, and without help. Subsided opportunities for specialist help in some sectors of the population (eg physical workers) would provide some answers for those facing the eventual retirement age change. The idea that only those affected by automation and technology need this help is too limiting in terms of harnessing the potential of our broader population. It is a reactive, not proactive solution. For news, events, blog posts, views and more! 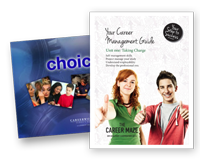 These books are available for career professionals, training providers, and school careers advisors. 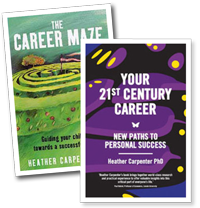 Parents may find The Career Maze and Your 21st Century Career books useful at home. These tools are available for career professionals, training providers, and school careers advisors. Parents may find Choices and Hands On tools useful at home. Interest = motivation = achievement = success. It all starts with interest. Good choices bring about better chances, and these produce the best career opportunities.